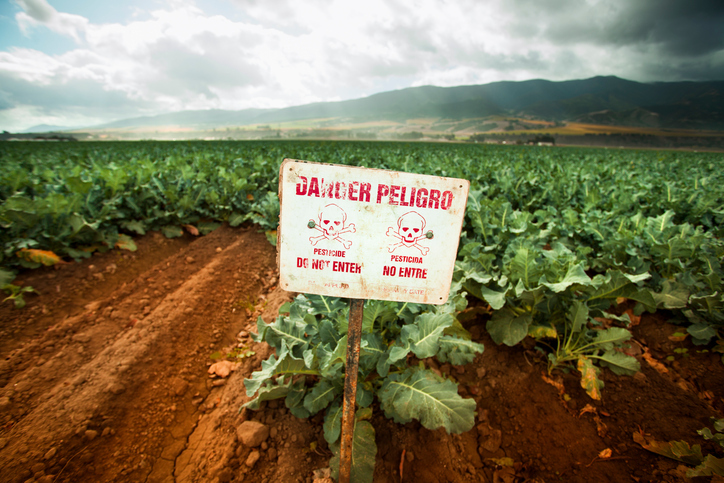 Glyphosate is the most widely used pesticide in the world. It’s the active ingredient in Roundup, the star product of agrochemical giant Monsanto. Glyphosate tends to divide people. Some say it’s entirely safe, while others swear it’s a deadly toxin. Both sides of the aisle get heated about glyphosate; the result is a tangled web of science and politics that can be messy to navigate. Here’s the Bulletproof perspective on glyphosate and going organic. The short version of this article is that the Bulletproof Diet recommends all organic food. Why? To help build better soil. The soil is made up of trillions of living organisms – or at least is should be. Glyphosate is unquestionably toxic for soil bacteria, killing beneficial bacteria and bugs that help your food grow. Organic food is glyphosate-free and supports healthy soil way more than conventionally-grown food. Bottom line: If you want to live at full power, keep glyphosate away from your skin, your food, and your soil. Read on for a more in-depth breakdown. In May of 2015, the World Health Organization (WHO) classified glyphosate as “probably carcinogenic to humans.” They based that classification largely on animal studies that showed that glyphosate caused tumor growth or higher incidence of cancer. They also talked about conflicting human evidence: one large-scale study found that glyphosate increases risk of cancer, while another similar study found it doesn’t. The WHO investigation also found that glyphosate is probably genotoxic (it causes mutations in DNA) and increases oxidative stress, which triggers inflammation and speeds up aging. Glyphosate also mimics estrogen, which could explain why it causes human breast cancer cells to grow in vitro. Then there’s glyphosate vs. Roundup. Glyphosate was not directly toxic to mitochondria in a study, but Roundup was. And while glyphosate alone is toxic to human placental cells, Roundup does significantly more damage to them. That begs a good question: all these studies are looking at glyphosate in isolation, but the vast majority of pesticide-treated crops are sprayed with Roundup. What else is in Roundup that hasn’t been studied? In those same emails, it also came out that Monsanto had employees write studies on glyphosate’s safety, then paid researchers to sign their names as if the researchers had done the studies themselves. 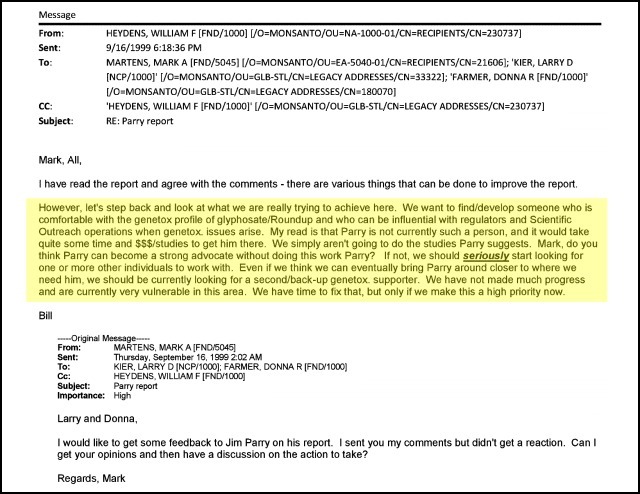 Then there’s the email from Marion Copley, a longtime toxicologist for the EPA, to Jess Rowland, the EPA official who works with Monsanto to determine carcinogenicity of glyphosate. As a result of Rowland’s work, the EPA declared that glyphosate is non-toxic and that there are no likely mechanisms that it can cause cancer. 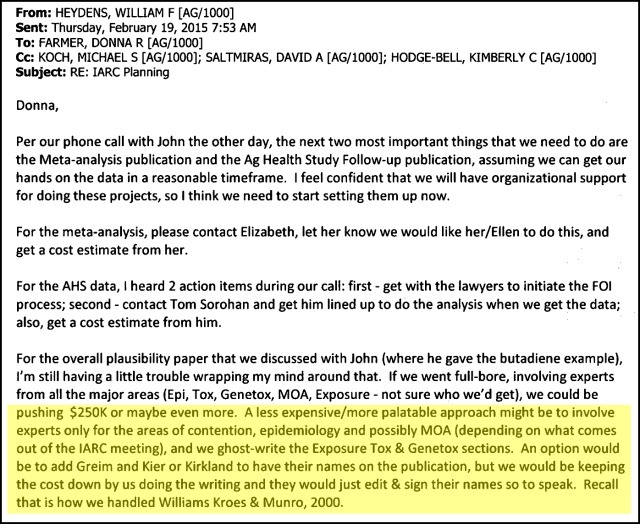 Copley (again, a toxicologist for 30 years) sent Rowland an email listing out 14 possible cancer mechanisms. 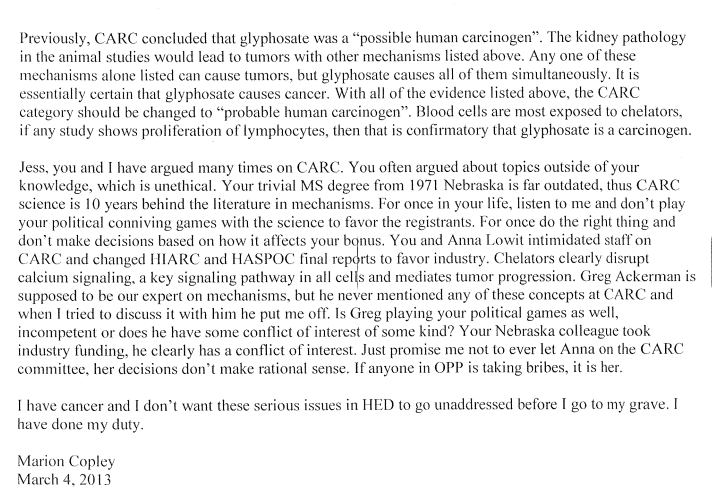 She notes that glyphosate causes every single one of them simultaneously, concluding that “it is essentially certain that glyphosate causes cancer.” Copley then accuses Rowland of taking bribes and intimidating colleagues throughout her career. You can read the email in its entirety here. All of this taken together makes it seem like Monsanto is hiding something. If you have a safe product, you don’t need to get rid of test results or write your own research and pay scientists to put their names on it. It does. Glyphosate accumulates in sprayed food. Organic food, on the other hand, cannot be sprayed with glyphosate/Roundup, and people on an organic diet have significantly lower glyphosate residue in their systems. Same with cows who don’t eat GMO feed, which is another reason to eat organic, grass-fed meat. This is especially important when it comes to protein. The “gly” in glyphosate stands for glycine, the amino acid that makes up your collagen and skin. Glyphosate gets used to make collagen in animals and people for this reason, meaning that when you eat non-organic meat, especially bone broth or collagen powder, you’re getting whatever dose of glyphosate was incorporated into the animal. Stick to meat and collagen from 100% grass-fed cows – no glyphosate-soaked grain in their food supply. It’s nearly impossible to eat organic all the time, even if many restaurants in bigger cities are proud to stock organic veggies and pastured grass-fed meat. If and when you’re exposed to lower quality food, there are a couple of things you can do to detox and repair any damage to your gut lining. Take activated charcoal. During and after a meal of questionable quality, pop a couple of charcoal pills to help your body bind and excrete any possible toxins. Drink water. Hydration helps all of your detox organs – your liver, kidneys, and skin – do their jobs to excrete nasty chemicals from your body. Eat a high-fat diet of undamaged fats. Glyphosate causes gut permeability and a high-fat, low-carb, low-sugar diet is amazing for gut health. Check out the Bulletproof Diet Roadmap for a list of healthy fats. Support bile flow and heal your gut. To support your gut lining and healthy gut bacteria, try a supplement like Restore. It’s a soil-derived supplement designed to support the health of your intestinal walls, which are damaged when your body is exposed to glyphosate. Buy organic when you can, and get to know which conventional produce has the highest pesticide loads. You can find a full list from the Environmental Working Group. And for more on glyphosate, check out this podcast with Dr. Stephanie Seneff. Read more here about detox methods that really work. Whatever you do, don’t be fooled when a big company selling an obvious poison tells you it’s safe. There is no case for spraying this stuff on our planet, and it’s one of the largest concerns I have about the health of my children as they age.